Areas of North Carolina and South Carolina serviced by main offices. Piedmont Vending's headquarters and main plant are located in Hickory, North Carolina with a satellite branch located in the Charlotte area. 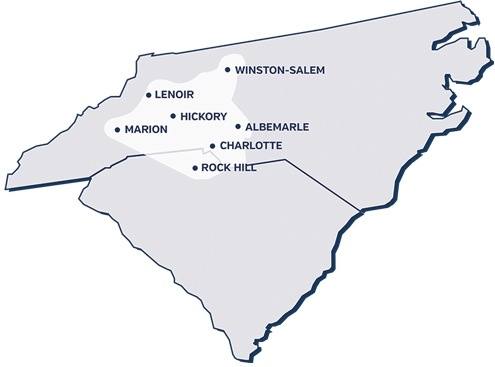 We service over 700 accounts in 8 counties in the central and northwest North Carolina. If you have any questions about being in our service area, please contact us. Our service personnel are veterans in the vending business, committed to prompt, dependable and friendly service. We guarantee immediate attention to all service calls. Most problems are handled within the hour. Our commitment to service satisfaction does not stop at the vending machine; it is also supported by skilled local management. Piedmont Vending is a leader in vending services because we work hard to guarantee efficiency and quality to all of our customers every hour of every day.